In September 2004, the National Church of Scientology opened in the heart of Madrid, with 6,000 assembling to celebrate the new Church. Mr. David Miscavige, ecclesiastical leader of the Scientology religion, dedicated Spain’s National Church of Scientology, welcoming the thousands in attendance to their new Church. “Madrid has to become a city of culture, peace and non-violence. And for that city of culture, peace and non-violence we need the Scientologists,” said Mr. Joaquin Antuña, Founder of Peace and Cooperation. “I have discovered that no other religion takes responsibility as clearly in favor of human rights as Scientology does,” said Francisco Jose Alonso Rodriguez, President of the Spanish Human Rights League, before the thousands in attendance. The ribbon cutting in Madrid’s Neighborhood of Letters marked a new era for religious freedom in Spain, with dignitaries from law, religion and human rights proclaiming Scientology as the hope for their country. Located in an historic building in Madrid’s Neighborhood of Letters, the National Church of Scientology of Spain is open to parishioners and non-parishioners alike. The reception area of the Church of Scientology Madrid, reflecting the country’s rich architectural traditions. The Church invites visitors and guests to use the building’s public spaces for coordination on community betterment and humanitarian programs which the Church supports. In September 2004, the National Church of Scientology opened in the heart of Madrid, with 6,000 assembling to celebrate the new Church. Once the seat of religious suppression, Spain now welcomed Scientology to the nation, with dignitaries from religion, law and human rights all proclaiming Scientology as the hope for their country. “Spain, and its people, held a very dear place in the heart of L. Ron Hubbard. “Yet beyond all of that there is, of course, all else this day means to not only our Spanish members, but to Scientologists the world over. “For if Spain was a land where our Founder lit a torch for freedom, it is also a land where you kept that torch alive. 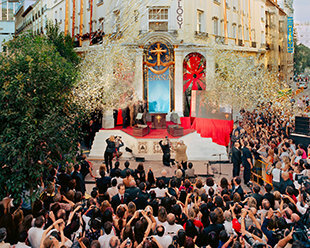 And with that, the ribbon was cut and thousands entered the new National Church of Scientology of Spain. After a battle lasting decades, in a landmark decision on October 31, 2007, the Spanish National Court ruled in the Church’s favor, granting the National Church of Scientology of Spain full religious recognition and affirming the right to religious freedom. Additionally, the court mandated the National Church be entered in the Registry of Religious Organizations.